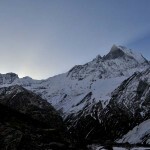 Annapurna Base Camp trekking is a trek all by itself, that a fervid trekker should not miss out in his lifetime. 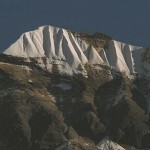 The climax is the glacier amphitheater. 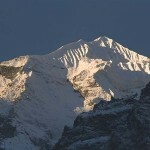 Besides being the central point from where climbers come to ascend Annapurna, one gets a circuitous view other peaks such as Annapurna III, Gangapurna, Hiunchuli, Machhapuchhre and Annapurna, besides others that make it a natural amphitheater . 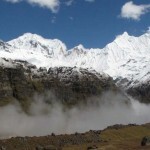 It is from here that Annapurna sanctuary gets its name and the Modi Khola (large stream) makes it tortuous descent creating the deepest gorge (12,000 feet) in the world. 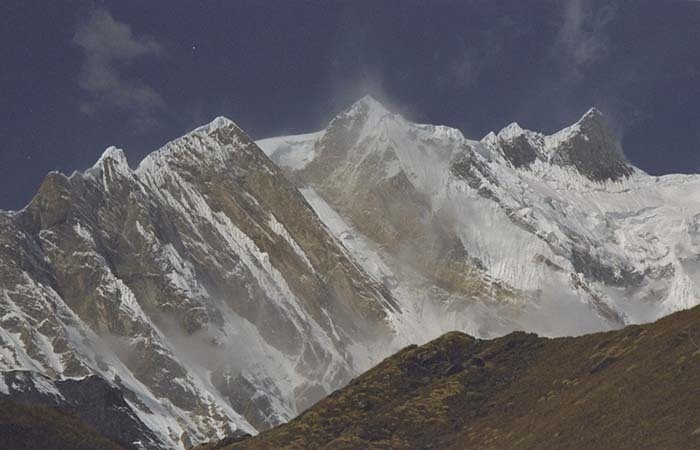 The scintillating view of glaciers, hanging pinnacles of ice, and the sonorous booms, of crashing ice and gushing water plus the wildlife and vegetation makes the arduous trek to Annapurna base camp trekking a memorable eco-adventure . This gorge gives way to fertilizing the valley below occupied by the Gurung Community. 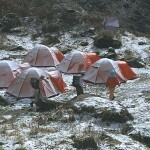 Despite the colossal height of the surrounding peaks, camping is a near comfort. 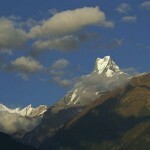 The trek starts from Phedi after a drive from Kathmandu. 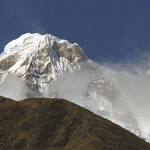 The destination is towards Dhampus on the outskirts of Annapurna sanctuary which begins the memorable pictures of the region. The following day, it is onto Tolka; you are well into the sanctuary which has one of varied Himalayan vegetation and wildlife. 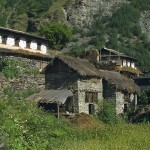 The next three days takes you on treks to Chomrong, Bamboo and Himalayan Hotel. 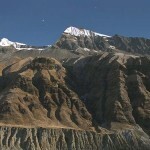 It is then you hit Annapurna base camp via Modi Khola. From here you retrace your steps back to Chomrong and onto Ghandruk, a model Nepalese village. Finally it is the trek to Nayapul and the drive back to Pokhara, and onwards home. 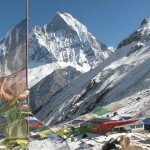 You have just completed your two week trek in the sanctuary of Annapurna where the diversity of human life, dwelling and the natural terrain will have an everlasting impact on any trekker with the saying, “I have been there too”. We first get to Phedi by bus and after a two hour trek uphill we get to Dampus where we halt for the night. O/N stay at Lodge. You rewarded with Mountain View which gets better as you get higher to the ridge. The trail then follows a paved stone trail till Pothana (1990m). 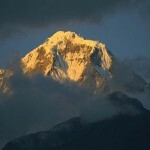 The view of Machhapuchhare comes into sight. Then paved stone trail moves through a forest to Deorali (2150m). Descending into a forest clearing, it is Bhedi Kharka, from where we descend to the head of a canyon and over a stream and then along it into the Modi Valley. After a short while we hit Tolka (1790m). O/N stay at lodge. The day’s starts by descending a stone staircase to suspension across Tigu Khola and then a hike along it. After several streams and crossing the Ghora Khola, we get to Landruk. Descending stone steps again, the downhill trail leads to the river and a bit climbing, passing terraced fields and a forest it is Himal and ahead the river at Naya Pul after which it is a steep climb to Jhinu Danda, Taglung. The trail bends around the corner, we get to Chhomrong. O/N stay at lodge. 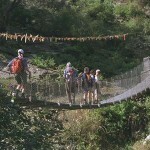 Again descending along stone trail, we cross a swaying suspension bridge. After climbing out of the valley, we pass a bamboo, rhododendron and oak forest. Then climbing over a rocky trail, we get to Sinuwa. Climbing further for an hour through a forest, the trek enters the upper Modi Valley. Descending a long steep, slippery stone trail, we get to Bamboo. O/N stay at lodge. The day’s trek begins with a steep climb through bamboo groves and rhododendron forest, frequently crossing streams and narrow bridges and sometimes stretches of snow; we finally get to Doban (2540m). Climbing and traversing high above the river, we get the sights of rushing rivers and a while later to our day’s destination. O/N stay at lodge. Climbing over avalanche area, through forests, ravines, we get to Deorali. It is here the South peak of Annapurana comes into view. 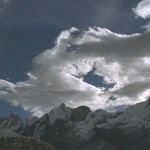 The trail descends to Modi Khola and along it gets us to Bagar (3270m). Moving over and easy trail over shown we get to Machhapuchhare base camp and after a two hour pleasant climb over snow, we finally get to the camp. We trek back by the same trail to the base camp finding it much easier on the way up. O/N stay at lodge. We again trek back the way we came to Doban and then making a steep climb back to Chhomrong. O/N stay at lodge. The trek first gets us to Taglung and walking west throught potato and wheat fields, we get to Dhiklyo Danda (2180m) and the trail drops to Khumnu, Komrong. A side trial west of Komrong along steep descend through boulders to a bridge over Kyuri Khola, we join the trail to Ghandruk. O/N stay at lodge. The day’s trek first takes to Chane, then Kimchi, Kehone Danda, Shauli Bazaar, Chimrong, Lamakhet Birethanti and finally to Naya Pul for our drive back to Pokhara. O/N stay at lodge. 12. Day Twelve – Flight to Kathmandu. We first fly to Kathmandu and then either rest for the remaining part of the day or go sightseeing the capital city of Nepal to buy souvenirs for folks back home. 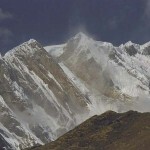 Pokhara-Kathmandu airfare ($91 per person). 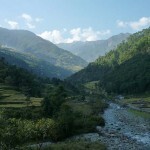 Local land transfers (Kathmadu-Phedi, Nayapul to Pokhara).